This recipe comes from Deborah Madison. She suggests making it in association with the Potato Chickpea Stew but it’s great on sandwiches, other stews, or as a dip. To roast the peppers, place them under a broiler or over a gas flame until the skins are charred. Put them in a bowl, cover with a plate, and set aside for 15 min. Peel and seed the peppers. Fry the bread in a little olive oil until golden and crisp. 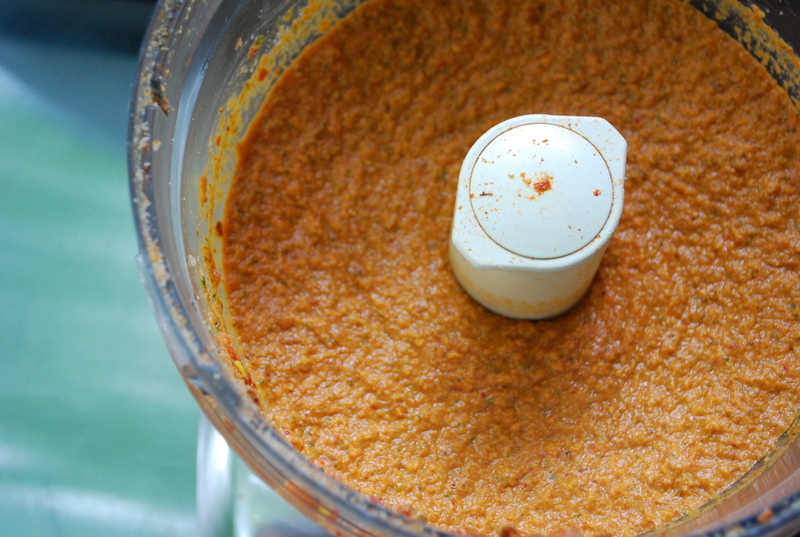 When the bread is cool, grind it with the nuts and garlic in a food processor or a mortar until fairly fine. Add everything else but the vinegar and oil and process or work with the pestle until smooth. With the machine running, or your arm working if you’re using a mortar and pestle, gradually pour in the vinegar, then the oil. Taste to make sure the sauce has enough salt and plenty of piquancy.